License Manager is a power tool for complete license and customer management. It allows control issue of license files and Unlock Keys for all your products as well as management of your customers list. License Manager allows you manage licenses for .NET Framework, Windows Store and .NET Compact Framework applications and controls. This application provides functionality to manage Activation Web Service and exchange information between local database and web service database (in case when Activation Web Service and License Manger use different databases). 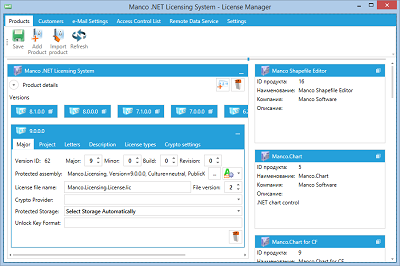 Using Manco License Manager you can also create encrypted code and data for your application, which make your application more strong against hackers’ attack. 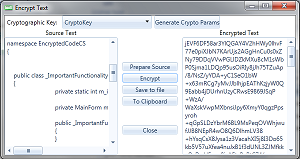 It also provides functionality to prepare your source code for encryption. This approach allows you design, implement and debug your class in a regular manner and encrypt it in a few minutes just before issue a product. License Manager allows you configure and send confirmation e-Mails with license file or Unlock Key to the customer.